Black-gaze act Deafheaven release their new album Ordinary Corrupt Human Love on 13th July via Anti-. 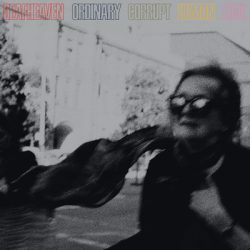 The follow-up to Deafheaven’s critically acclaimed 2015 album New Bermuda, Ordinary Corrupt Human Love finds the band expanding their sound with layered psychedelic vocals, jazz-inspired percussion, and intricate piano melodies. The album takes its title from Graham Greene’s The End of the Affair, reflecting a theme of hazy, yearning romanticism threaded throughout the songs. This fourth effort from the band demanded that they push their boundaries further and deliver up something that could equal and surpass, what many saw as ground-breaking, their previous efforts. Ordinary Corrupt Human Love certainly pushes the boundaries of Deafheaven’s sound into new territories. One of the most striking changes is marked by the focus shifting away from the howls and black metal vocals of George Clarke. Don’t worry, they’re still there in abundance, this time they’re lower in the mix and provide a counterpoint and complement for the music rather than adding a different texture. This is perhaps down to the general feel of the album, it’s not as dark and brooding. There’s a happier, more life affirming feel to everything. Encapsulated by lead singles ‘Honeycomb’ and ‘Canary Yellow’, there’s a positivity flowing through the record. Especially so in ‘Canary Yellow’, while many could consider the riffs a visceral assault there’s a light air that exudes happiness and in the final moments the song changes form, giving way to gorgeous guitar melodies and beautifully haunting gang vocals. The intro to ‘Near’ is almost like a lullaby before you’re led into post-rock textures through a shoegaze ballad before ‘Glint’ acts as a love letter with forlorn energy before it explodes with pounding, deafening riffs in its fourth minute. It might be blackgaze at its finest and purest but somehow Deafheaven manage to make it sound positive. There’s the gentle gothic anthem ‘Night People’ with Chelsea Wolfe guesting to add another haunting layer before the closing opus of ‘Worthless Animal’ takes you through the wringer. Emotional and visceral, this is what Deafheaven are all about – essential listening.